Henrique Capriles held a press conference yesterday, which he duly posted on his new Internet TV Channel (is there such a thing?) capriles.tv. In it, he let slip a significant piece of information: the transition away from chavismo is going to require a Constitutional Assembly. This is a marked change for him, and for the opposition in general. There’s been a significant amount of anxiety recently about Capriles and the opposition. “Where are the marches?” our more contrarian voices seem to say as they see Brazilians taking to the streets to fight for their rights. “Where is the leadership?” they seem to cry when foreign dignataries line up to recognize Maduro and dismiss the opposition. Capriles is the undisputed leader, but there is some grumbling about where this whole thing is going. Sure, so far Capriles had said that we were going to participate in the municipal elections, scheduled for December of this year. But this was a tactical move, not a strategic one. Where is the strategy? What is the long game? Yesterday marked a significant point in the process of coming up with an answer to that question. 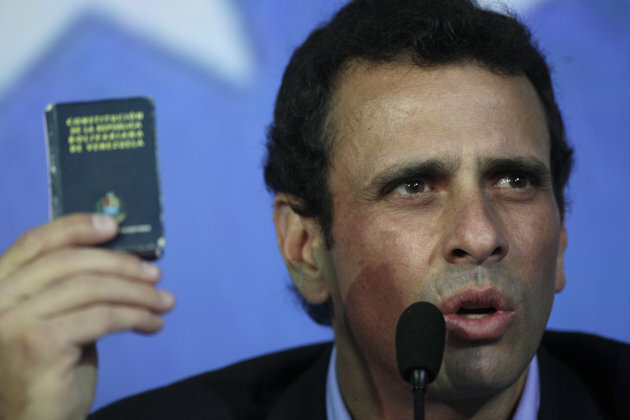 It’s worth pointing out that Capriles’ support for a Constitutional Assembly is new. As recently as November of last year, Capriles was denying it was even necessary. Personally, I remember hearing Ramón Guillermo Aveledo say the same thing right before last October’s election. It took the events of this year – the TSJ ruling saying that Chávez didn’t have to take the oath, the ruling allowing Maduro to run as candidate, the unprecedented abuse in state powers, and the conspiracy to commit fraud in April’s election – to convince the opposition that the only way to end chavismo is with a scorched-earth policy. Chavismo will end like it started – with a popular sweep that leaves no institution untouched. When the end comes, it will come for everyone. There will be no insititutional coddling between whomever succeeds Maduro and, say, Luisa Ortega or Tibisay Lucena. The next President will not sit down and negotiate witrh Rafael Ramírez or Henry Rangel Silva. There is no Maritza Izaguirre within chavismo. In order for it to work, this strategy requires time. The opposition needs chavismo to fester a bit more. The economy needs to deteriorate further for this scheme to work. Capriles seems to be hinting that we need to hit rock bottom, and that we’re not there yet. It’s an open question whether or not this will work. But I’m convinced that’s where we’re headed.